The Farm is open every Friday and Saturday from 9am-5pm, come out to our shop and enjoy the farm, gardens, earthen buildings, renewable energy system, tire swing & nature trail. Other visits by appointment. (No Sundays please... see you in church!). *Want to personalize your own class? View our Build Your Own Class page! to save a spot - classes fill early. *A deposit is required to guarantee your spot, first come-first serve, send half of the class cost, payable to Quiet Creek, 93 Quiet Creek Lane, Brookville PA 15825. Deposit is non-refundable. *Children (16 and under) accompanied by a paying adult are welcome at half price. Child care may be available when registering early (depending on if we have available staff), please call or email to inquire. $3 per child per hour. Quiet Creek open Fri/Sat 9-5 p.m. Please register early, classes fill quickly. 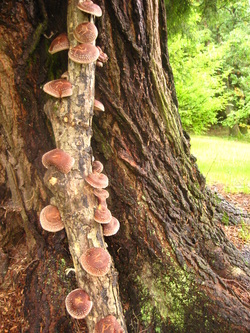 Discover the key concepts of growing, harvesting, preserving, and cooking Shiitake and Oyster Mushrooms, as well as using them for medicine. Since 1996, Quiet Creek Herb Farm & School of Country Living has been offering workshops on sustainable living – mushrooms are an exciting part of our mission.